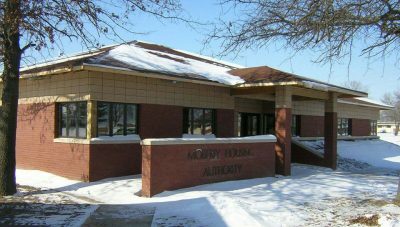 Moberly Housing Authority Community Center - PWArchitects, Inc.
PWA designed and oversaw the construction of this 4,500 square foot multipurpose office building and community center. PWA worked closely with the Moberly Housing Authority staff to develop a functional, energy efficient and environmentally sensitive design for this green building that meets the current needs of the Housing Authority and the Moberly Community. The entrance to the single-story brick exterior building faces south, minimizing the exposure to north and west winds. The exterior was landscaped with native plants and included an earthen berm on the north/west side of the building to shield the structure from north and west winds. All occupied office spaces were positioned on the exterior walls of the building to maximize views. Operable windows in these offices open to the south to allow for prevailing summer breezes. Larger windows were placed on the south side of the building to take advantage of winter solar gain. Energy-efficient HVAC and lighting were also used to increase the overall efficiency of the building. Environmentally sensitive materials were selected including linoleum, a rapidly renewable resource. Forest Stewardship Council certified lumber and urea formaldehyde-free oriented strand board was used for the roof and wall sheathing. Fly ash was used in the concrete to reduce the amount of required Portland cement, and recycled materials were selected for the countertops and toilet partitions.